With the release of director Joe Swanberg's indecisive yet appealing Hannah Takes the Stairs which endeared mainstream audiences to the charmingly fearless talent of actress Greta Gerwig, viewers received their first taste of the "mumblecore movement" as the initial production which was granted the widest release. And the result of the experimental Hannah being readily available at video stores and theatres near you divided and baffled audiences completely. Reactions ran the gamut and most were extreme in response to the badly dubbed "mumblecore" movement. On the negative side, there were those who found their do-it-yourself, low-budget style of filmmaking that overwhelmingly relied on naturalism and rambling conversation pretentiously loathsome and lazy. Yet in a completely different light, some indie film enthusiasts felt they were revelatory, inevitable, and inspirational descendants of flash and gimmick free character works by independent filmmaking forefathers especially John Cassavetes. 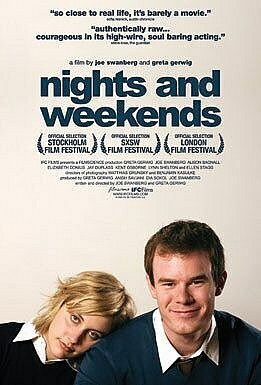 Although Hannah marked the first time I was consciously aware of the film as mumblecore, it wasn't my first experience with the movement as prior to Swanberg's release, I'd truly appreciated what I felt was the superior and seemingly more controlled work of Andrew Bujalski as evidenced in Funny Ha Ha and Mutual Appreciation. And while I think visually, the most impressive cinematic release from the 'core can be witnessed via Aaron Katz's Quiet City, Swanberg and Gerwig's post-Hannah title Nights and Weekends is easily the most mature and psychologically fascinating release I've seen so far. Co-directing the work in which they've also written and play the major roles, in the IFC Films and MPI Media Group press release, Swanberg and Gerwig acknowledge that they were acutely aware that by embarking on the film's eighteen month shoot that examined "the dangerous territory where relationship are born and die," the result could've been a professional and personal relationship-ending landmine. Noting that "the photographic evidence of that process still startles us," as the two share that the film presents "little bits of ourselves scattered around, like debris from a car accident we lived through," Nights and Weekends charts the emotionally draining dope-like highs and withdrawal-like lows of a long distance relationship. 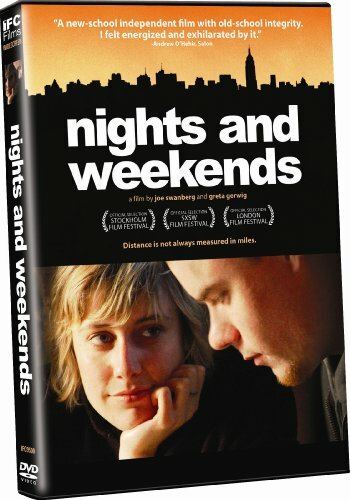 Despite the overly graphic opener depicting the high-caliber lust shared by twenty-somethings Mattie (Gerwig) and James (Swanberg) upon reuniting for stolen weekends in either Chicago or New York, when the harsh light of day begins we realize just what a draining toll the effect of the separation is having on their relationship. Taking out their frustrations on one another by picking bizarre fights and engaging in strange digs over everything from her insistence that he doesn't eat a banana in front of her and his perceived insensitivity in not preparing for her visit by going into do something at work that he could've done earlier in the week, we get the sense that they're doomed from the start. For, much like a child who loves the freedom of riding the bus home from school on Friday afternoon only to feel melancholic on Sunday because they know that school is only hours away the next day, after the elation of the "hello" wears off, the anticipation of "goodbye" creeps into their consciousness. Shortly thereafter, the two hyper-analyze moments that aren't perfect, lament living in different cities, and openly fear for the future if their relationship doesn't result in a pregnancy, a permanent move, or starting to lose the bond that had linked them initially. And in fact, when the movie begins, we realize that the two understand each other less and less as the narcissistic characters participate in easily the most annoying aspects of mumblecore such as its tendency to segue into a solipsistic downward spiral but the difference is in Nights and Weekends, instead of just filling up space, there's another layer to the rambling anecdotes, metaphors, and nitpicks. Since the bulk of the roughly eighty minute and supremely personal work occurs without supporting players, aside from a couple of emotionally revealing sequences with Mattie and James' relatives that accentuate the trouble in their relationship and foreshadow what's to come, we can only rely on Mattie and James for our guidance on who they are and why/how they've fallen in love. Thus, maddeningly at times, it's left for the viewer to fill in the blanks to the point that some of the critics reviewing the film even managed to get the occupations of the characters wrong and we're challenged even more as the two halves of the work were filmed a year apart and the two individuals featured significantly evolve. Despite our wish to know more which is contradicted with the feeling that we wouldn't want to spend any time with either character if given the opportunity, the film is nonetheless one that manages to strike a nerve. This is especially apparent when you consider the authenticity and bravery of the portrait in question. Atypical for their profession, Gerwig and Swanberg's willingness to go for unflattering and flawed reality instead of ego-saving polish must be commended. And while most of those writing about the film seem to fixate heavily on two extremely graphic scenes of naked and emotional sexuality, I was more struck by some of the quiet moments and clever cuts utilized throughout. For, if you look past those distractions, you'll be surprised by their inclusion of some truly psychologically revealing moments, particularly involving Gerwig who never fails to make us believe she isn't acting anytime she's onscreen. For example, the duo weave a subtextual thread in what one critic considered a dull throwaway scene as Gerwig holds a crying baby that is later picked up again most exceptionally as an inquiry over whether the two will exist in the future simply as soundbytes before the film leaves their relationship status uncertain by breaking up the halves with a "one year later" note. Likewise, the movie constantly asks the viewer if art is imitating life or vice versa-- poignantly in one moment that seems to recall the filmmakers' own statement about watching the film that follows a photo shoot when the characters look at pictures of each other that capture things that are either false or details they hadn't acknowledged aloud like a teary eyed look of longing. While much like Hannah, there are those who just won't get it or ever be able to appreciate the low-budget, fly-on-the-wall docudrama like realism these films manage to transfer to celluloid. Yet, despite the fact that like some of the difficult and emotionally grating characters evidenced in the superior films of John Cassavetes, Mattie and James aren't the easiest people for us to warm up to throughout, I'd challenge viewers who've rejected the works in the past to at least give this one a try. New to DVD with the bare minimum of special features, unfortunately the movie which played as an official selection at the Stockholm, London and SXSW Film Festival didn't receive as much press or attention as their previous work but the transfer from HD Video to DVD is excellent. And nicely following up Hannah, this one definitely Takes The Stairs to move far beyond the perils of being single into a powerful and provocative project about the perils of admitting when the passion and connection are gone and/or if your relationship can survive the limits of geography.